Are you looking for a quick healthy dinner to make on a busy weeknight? 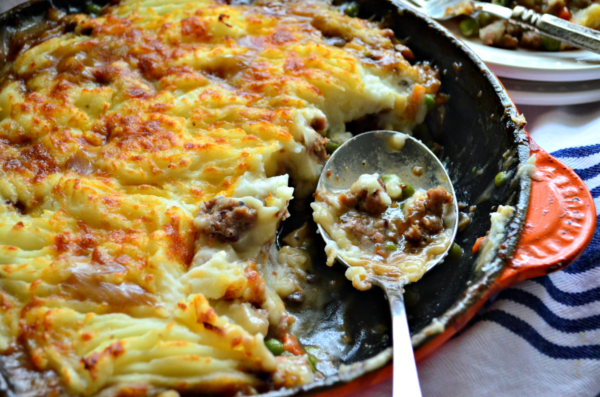 My family loves this Skillet Turkey-Bacon Shepherds Pie. Best of all I can use my secret ingredient to speed up the cooking process: Mighty Spark Food Co. Turkey & Bacon Ground Blend. It’s the perfect flavorful substitute for beef! Mighty Spark Food Co. products have flavors and spices added to them, it makes the preparation work very easy – it’s an easy weeknight meal that takes less than 20 minutes to make! These protein and flavor-packed fresh ground chicken or turkey products will be available at Publix – some ideas for creating a recipe could be lettuce wraps, a pasta dish, or even adding the turkey to a salad. Let’s talk about how quickly this meal comes together–in less than 30 minutes dinner is on the table. I start by breaking up and browning the Mighty Spark Food Co. Turkey & Bacon Ground Blend. Then, I add in chopped mushrooms, frozen pea and carrot mix and let those cook for a few minutes. You want to preheat the oven while your cooking dinner on the stove top. Once the ground turkey is cooked thoroughly and the mushrooms are beginning brown you’ll add in mushroom gravy. Next, take cooked mashed potatoes and begin to carefully top the skillet filling all the nooks and crannies of the skillet. Lastly, a sprinkle of shredded cheddar on top and the skillet goes into the oven until the potatoes begin to turn golden brown and the cheese is bubbling. 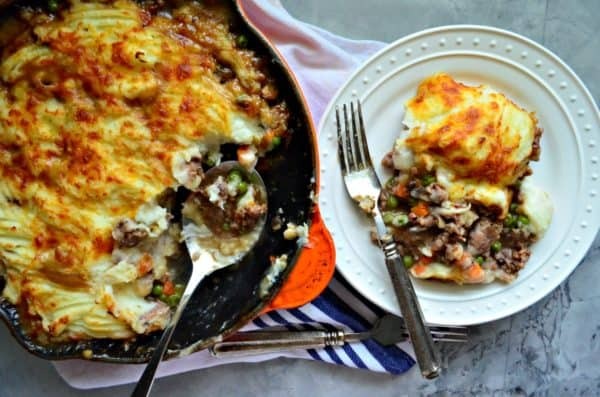 Divide the shepherd’s pie evenly among four plates and enjoy dinner! I love how quickly this comes together with few ingredients and best of all so much flavor thanks to the Mighty Spark Food Co. Turkey & Bacon Ground Blend. It’s currently on sale at my local Publix and you can save $3 on any one Mighty Spark Food ground chicken or turkey blend. I made sure to stock up so I can have it available for quick weeknight meals. 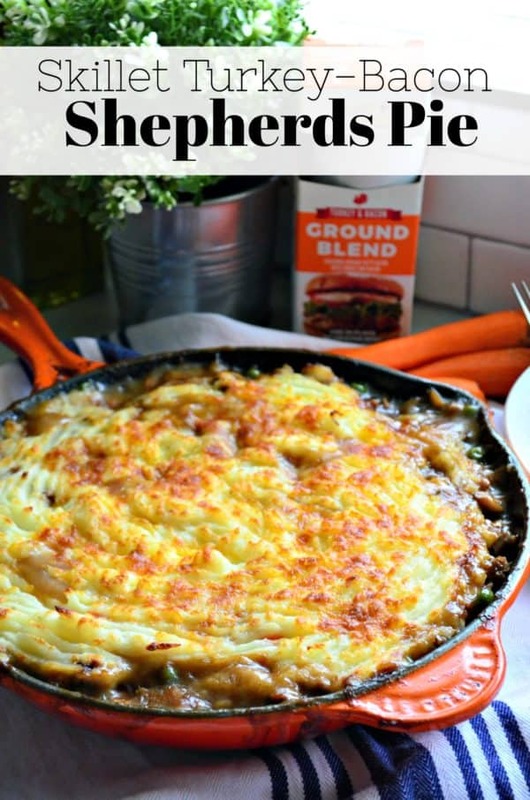 If your looking for a simple yet flavorful dinner I hope you’ll give my recipe a try for Skillet Turkey-Bacon Shepherds Pie. In a 10-inch cast iron skillet heat the 1 teaspoon of grapesead oil on medium heat. 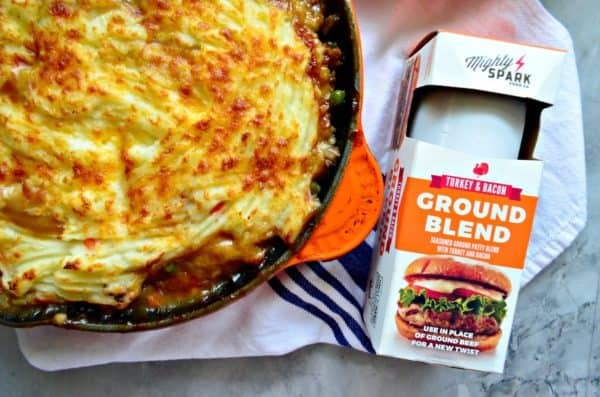 Place the Mighty Spark Food Co. Turkey & Bacon Ground Blend in the cast iron skillet and begin to break it up into bite-size pieces with a wooden spoon. Continue to break up pieces and cook for 10 minutes or until all turkey is cooked. Then add in the white chopped mushrooms with the turkey & bacon ground blend. Mix well and cook for 2 minutes. Then add in the frozen pea and carrot mix. Continue stirring and cooking for 3 additional minutes. Preheat the broiler on high heat. You'll want to re-heat up the mashed potatoes per the package instructions at this time. Add the mushroom gravy into the skillet. Mix well and then turn off the heat. Carefully, begin to top the skillet with the cooked mashed potatoes. Then top with the shredded cheddar cheese. Place the skillet on an over-sized baking sheet. 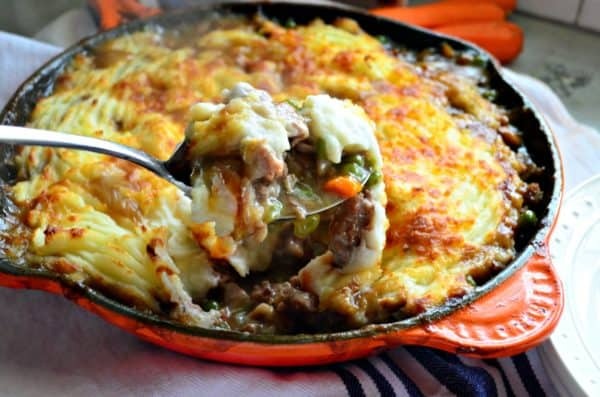 Place the skillet in the oven for 1-2 minutes or until the mashed potatoes are golden brown and cheese is bubbly. Carefully, remove from the oven, and divide evenly among plates.